Merely getting the air conditioning installed is not going to get you what you wanted. For the first few months, you would be getting the best cooling and heating. However, with the passage of time, you need to have it maintained thoroughly. It, therefore, becomes essential to have it thoroughly maintained on a regular basis. Experts suggest having the maintenance particularly at the start and end of every season. There are several advantages associated with the on-time maintenance of the unit. Not only they prolong the life of the unit but also make sure that their efficiency and performance enhance considerably. The following article highlights the principal parts or the accessories of the air conditioning system that should be given the stress when it comes to maintenance. A thorough cleaning and replacement of the air filter should need to be set as a priority. A thoroughly cleaned filter ensures that there is a proper flow of air. A clogged filter consumes more energy and has the dismal performance. The modern-day air con companies are ensuring that their units have the reusable filters while some of the models have the replaceable ones. Before getting it done, it is necessary to make sure that you know the type of the filter that is being used. As a part of maintenance, the filters are cleaned with warm water. For the replaceable filters, it is recommended to make sure that the filter is replaced after every couple of months depending on the frequency of usage. It is done on priority to ensure that your house remains free from allergens and other air-borne diseases. The aircon systems have two different types of coils – evaporator and condenser. Both these coils play a pivotal role in the proper functioning of the unit. Soiled or dirty filter impairs the performance of the coil by lowering the heat absorbing quality of the coil. Therefore, after the aircon install, what one needs to focus primarily on the filters and performance of the coils. The coils are also prone to the accumulation of environmental dirt. For the optimum performance, it is essential to make sure that your system has the perfectly aligned fins. With the time, the fins tend to bend which negatively affects the system. Therefore, the experts with proficiency in aircon repair should be hired. They know the best techniques for getting the bent fins aligned. Apart from these important parts, there are other parts as well which needs attention. Hiring a professional is always going to make sure that they take care of those functional elements that often remain neglected. Like the refrigerant, leakages in pipes, and the measurement of the airflow. The professional checks for the proper refrigerant level and all the leakages (if present) and mend them accordingly. 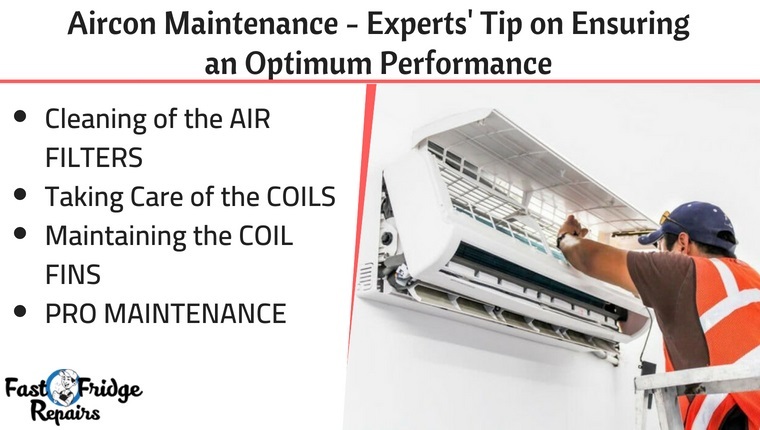 To ascertain that your system has the best performance under any of the weather conditions, it is mandatory to have the thorough maintenance of every part of the unit. The professional technician never leaves any of the stone unturned when it comes to aircon’s optimum performance.